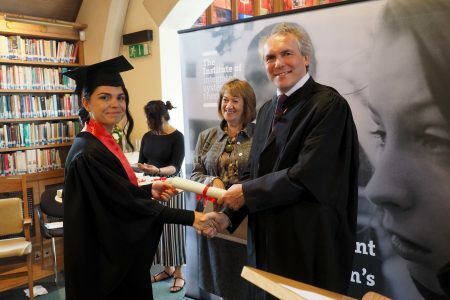 On 18 July 2018 The Institute of Integrated Systemic Therapy held their first graduation ceremony for students who had completed their iST Diploma and Practitioners Diploma training. Childhood First’s unique and effective therapeutic approach is called Integrated Systemic Therapy (iST) and has been developed over 40 years to meet the needs of children and young people suffering serious emotional and behavioural disturbance. Our therapeutic training program in which all care staff participate is clinically accredited by the United Kingdom Council for Psychotherapy (UKCP). This means all the children in our care are looked after 24/7 by accredited psychotherapeutic health care professionals. “Students from the Kent and Norfolk communities came to the graduation event at Southwark Cathedral, Garry Weston Library, London Bridge. “The ceremony was opened by Stephen Blunden CEO of Childhood First, with a final address by Jennie McNamara to close the ceremony.